With a World Cup win under their belts, the U.S. women’s soccer team has their eyes on the next prize – closing the pay gap. Five players from the U.S. Women’s National Team have filed suit against the US Soccer Federation for wage discrimination. The complaint, made on behalf of the entire team, claims the governing body of U.S. soccer pays them four times less than the men’s team. To put that into perspective, the women’s team was paid $2 million for winning the World Cup, while the men’s team got $9 million for losing in round 16. “I’m proud of my team, I’m proud of all of us coming together and saying, ‘This is the time that we need to push for equality and we need to push for what’s right’ and people are paying attention,” said Goalkeeper Hope Solo. But in 2015, the federation spent more than $31 million on the men’s team, while spending only $10 million on the women, regardless that the women’s team is estimated to bring in a $5 million profit this fiscal year, while the men are expected to show a deficit of $1 million. The cherry on top of this sundae of discrimination? The women’s team generated far more income for the federation – $20 million more in 2015 – than the men. The reality of the situation is that women make an average of 79 cents for every dollar a man makes, whether an all-star soccer player or not. The estimated loss of a woman’s earnings compared to a man is $700,000 for a high school graduate, $1.2 million for a college graduate and $2 million for a professional school graduate. This statistic has barely budged in a decade and has been a political hot button issue for years. At the current rate of increase in pay for women, the wage gap isn’t expected to close for more than 100 years. 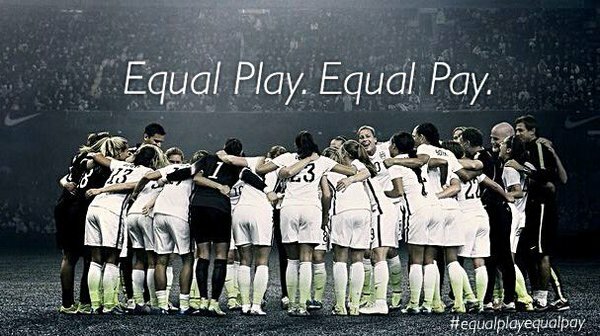 But with the U.S. women’s team now addressing the issue on a larger scale, the wage-gap is harder to ignore across the board, creating a stronger public pressure that could potentially influence policy makers to finalize legislation like the Paycheck Fairness Act, a modernized version of the Equal Pay Act (1963, which includes measures to help close the wage-gap. .
It’s time to get off the sidelines and join the U.S. women’s soccer team in being heard. Celebrate Equal Pay Day on April 12 by contacting your representatives, submitting an op-ed to your local paper, hosting a workshop on salary negotiations or using #equalpay while tagging Moxie to let us know how you are fighting the wage gap.